In The Moon Embracing the Sun episode 14 broadcast on February 16th, 2012, Yeon Woo (Han Ga In) recovers all her past memory, and the solid acting by Han Ga In has been critically acclaimed. 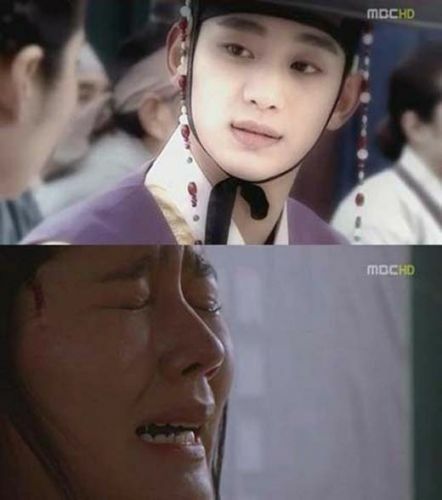 With the help of Lee Hwon (Kim Soo Hyun), Wol (Han Ga In)’s life is saved, but she is expelled to infirmary care house after been engraved with a word of “sin,” where she is been vilified by others. Queen Dowager Yoon (Kim Young Ae) orders Wol to go to the Hidden Moon Court where Yeon Woo was staying before her death, so that she can appease the soul of the deceased person, as she feels ominous about hearing the sobbing of Yeon Woo. Wol is locked at the Hidden Moon Court alone. She suddenly saw a spirit that looks exactly like herself, and immediately awakened from a dream. After the broadcast, audience said, “The captivating expression in the eyes of Han Ga In is great,” “The last 10 minutes that make my hair raising,” “The crying scene of Han Ga In is shocking,” and so on. With the recovery of memory by Yeon Woo, the ins and outs of the case for crown princess will be revealed, as such how will the drama develops in future have many viewers looking forward to.